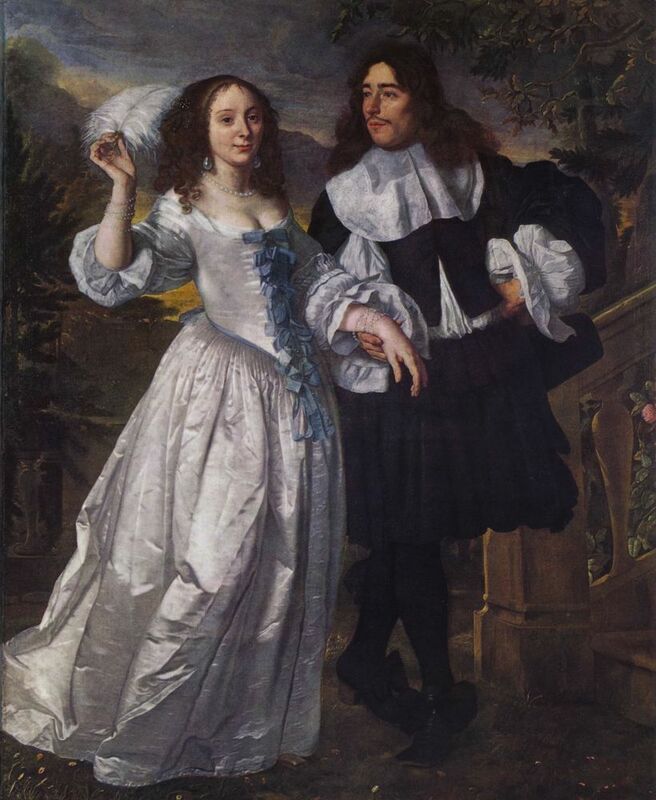 The 1660s Ninon gown – now with trimmings! 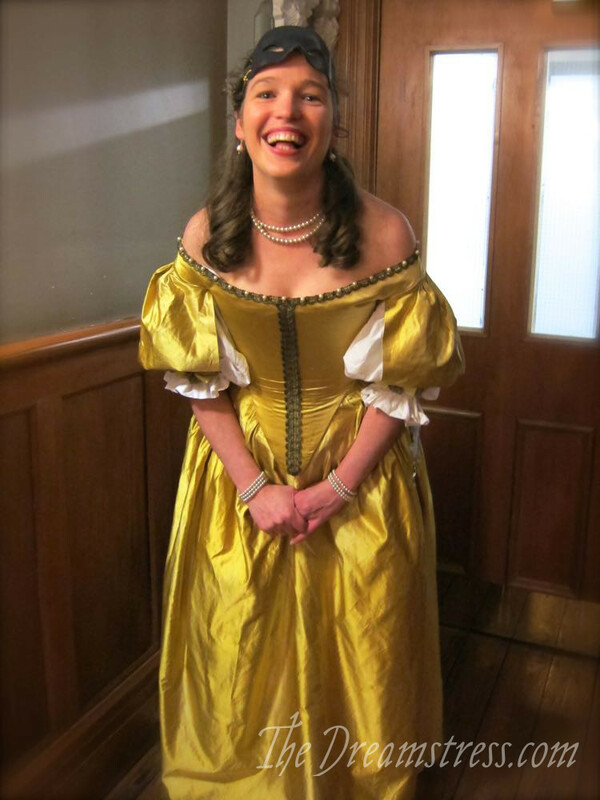 I’ve held off on trimming the Ninon gown for literally years, because I loved it so much untrimmed, and have been afraid I wouldn’t like it as much trimmed. But I’ve finally sucked it up and done it, and (luckily!) I love it even more with trimming! At first I leaned toward the ribbon for simplicity. 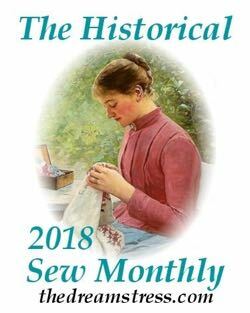 I’ve got some rather nice quality viscose ribbon that is a good match for the ribbons on van der Helst’s woman in colour, width and texture. I made a bunch of bows from them and pinned them up the front, and while they looked lovely, the were a little too obvious. This trim mostly came off of a large doily/table cloth type thing from the 1970s. 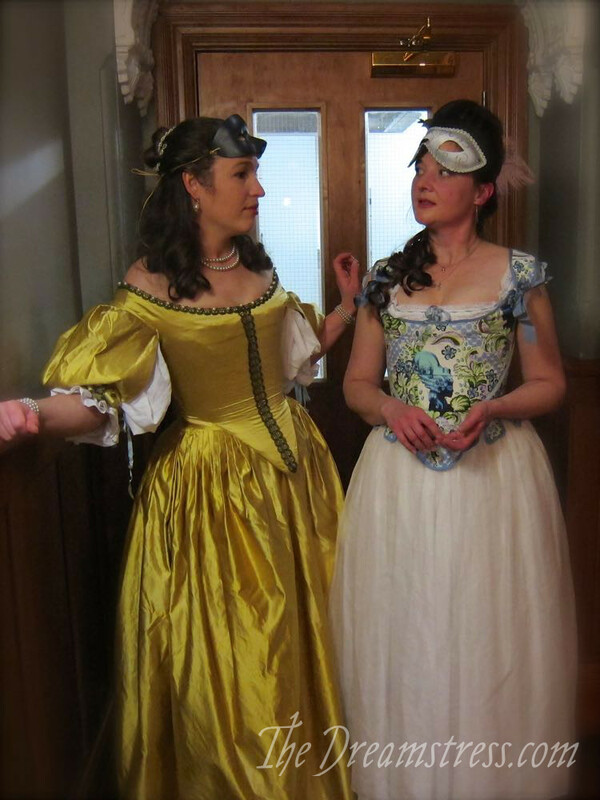 It had a red velveteen back and a brocade front, and the trim sewn round the edges. 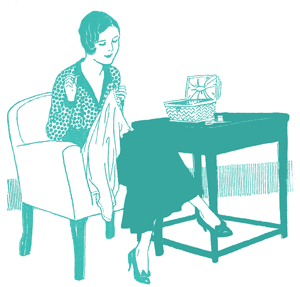 I’ve seen similar smaller doilies in the exact same materials at op shops over the years, so it must have been a ‘thing’. I haven’t picked up the smaller ones because the price didn’t match the amount of trim I’d get off of them (and at the time I wasn’t buying it for a purpose), and unpicking the trim was a headache and a half. In retrospect, I wish I had! 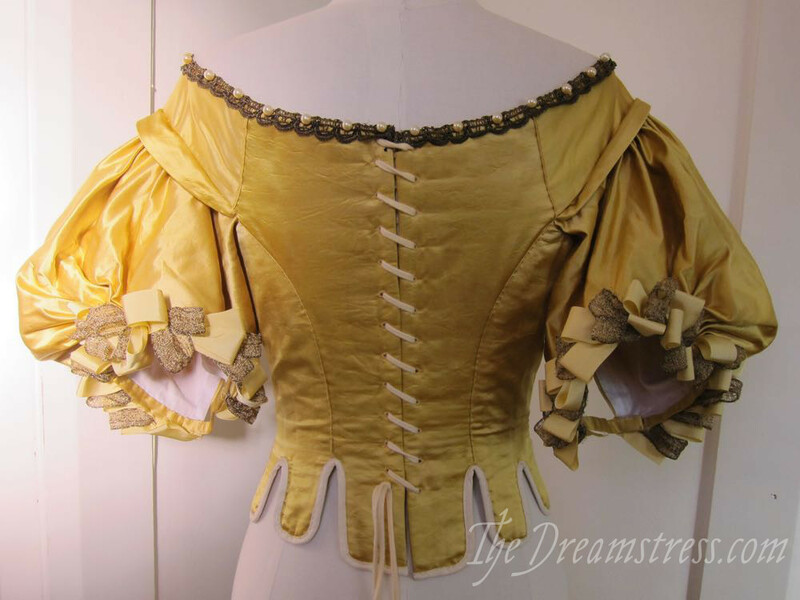 Look how beautiful the trim looks turned and sewn back up down the front? 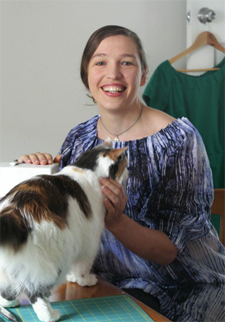 I had almost EXACTLY enough to trim the dress down the front and around the neckline, with less than 3″ of trim left over. 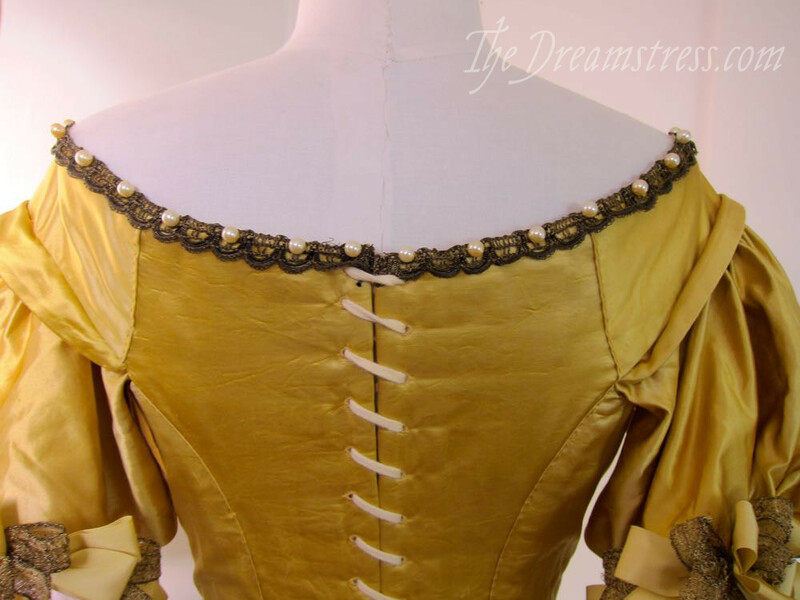 I really like the way the trim provides quite a strong contrast to the yellow, while still being quite subtle. For the sleeves, I got creative. 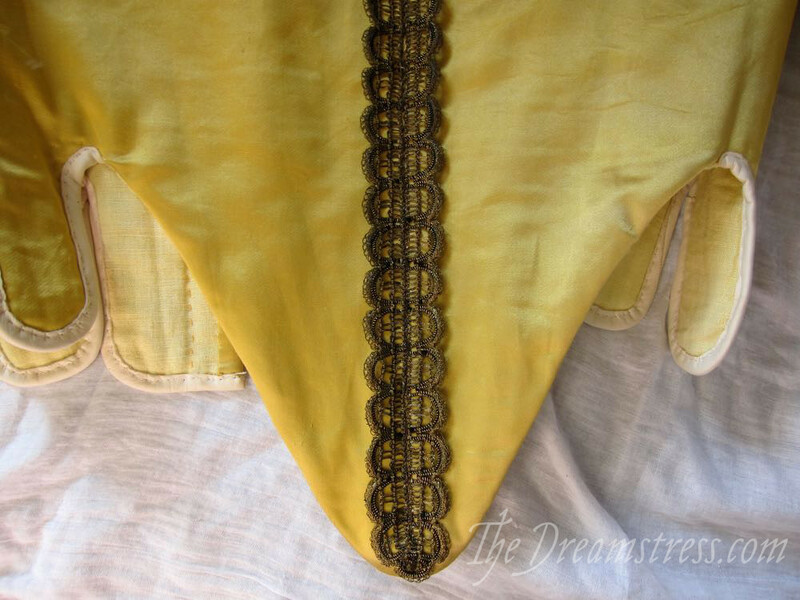 The yellow ribbon is a nice viscose grosgrain, and the gold lace trim is (believe it or not) the selvedges from some scraps of reasonable quality gold-lace fabric that I picked up in a bulk bag of fabric from an op-shop, and kept, just in case they could be useful. 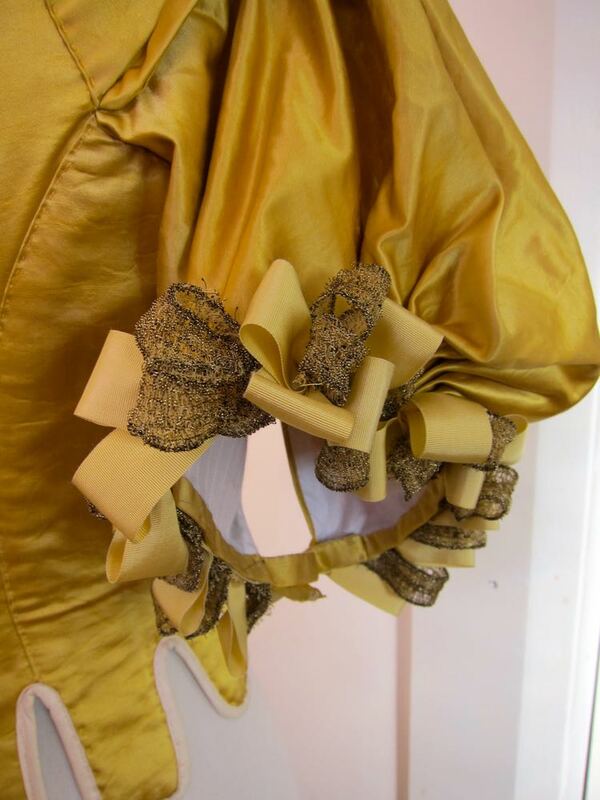 Inspired by Élisabeth’s sleeve’s, I formed the ribbons and lace into loops, and sewed them on to a length of ribbon, which I then sewed around the sleeve cuffs. I love how they just peek out from the fullness of the sleeve. I was afraid they would be very overpowering, but actually, they are quite subtle. 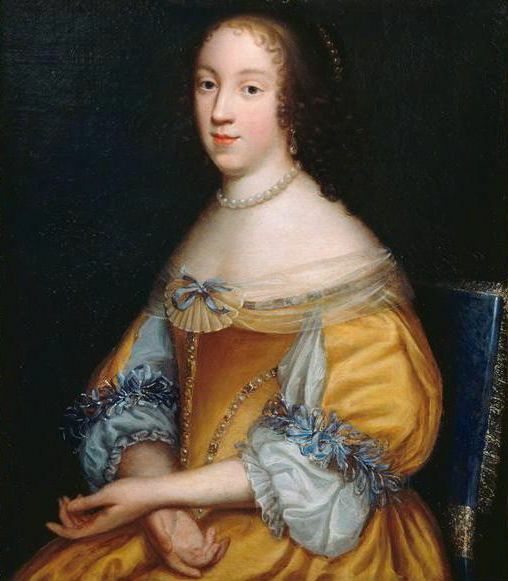 In retrospect I wish I’d included blue ribbons too, just like Élisabeth’s, so they are a little less subtle. Someday I may unpick and re-do. 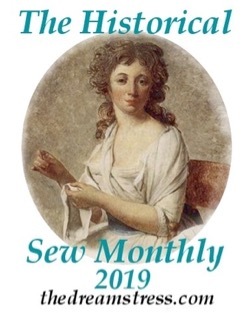 I’m also on the lookout for more of the passementerie trim, so that I can sew the curved seams of the bodice front (though they aren’t entirely necessary, as there are plenty of examples without them. But for now, a fully trimmed Ninon! 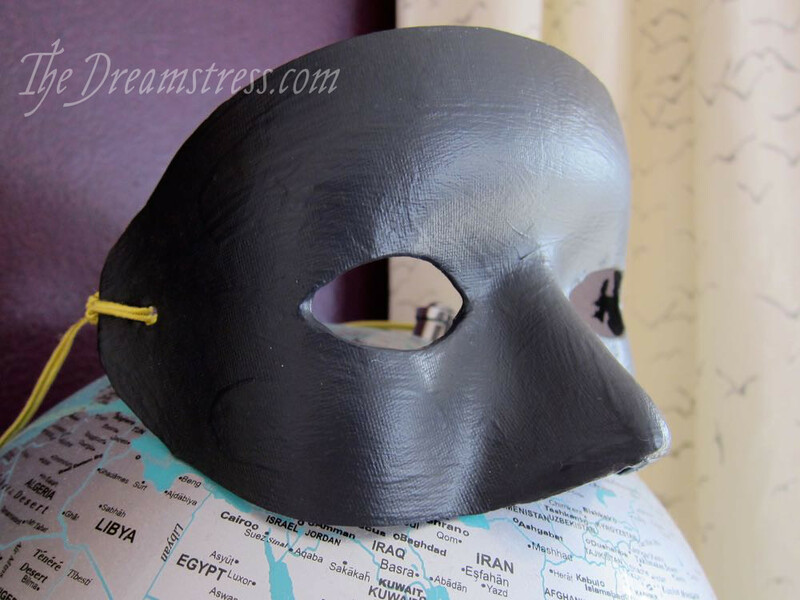 And, just in case anyone is wondering, the mask is a simple full-face paper mask, cut down to follow the simple curved shapes of the masks seen in 17th & 18th c masquerade portraits (though theirs had a lot less face shaping), and painted a dark purple-black, which I was delighted to discover is Resene ‘Bastille.’ How appropriate! The sleeves are perfect. Just perfect. Maybe with a tiny cluster of pearls here and there. You know – those ‘one pearl in the middle, seven or so framing it’ clusters. It suits you so well. The colour is a joy, the style is perfect on you. And how felicitous about Resene ‘Bastille’! Yay! I’m so pleased you do! And that you are converted 😉 The blue bows were very good, but this was PERFECT. I thought you might remember the trim and the runners it came on. I need to put the word out so people can keep an eye out for it, as it was definitely a ‘thing’! Just glorious! The simplicity of the trimmings lets the whole gown ‘sing’. As much as I liked the idea of navy bows at CF I love what you have done (I think I liked the idea of yellow and navy more so than the ideas of bows). I’m so jelly, I wish I had reasons to create such gorgeous gowns, I can’t find any opportunities here in Australia! I’ll keep looking though! It is delightful. Love the colour and the trims work well. Thank you! I guess I haven’t posted many back views! And it’s cool to see it on a mannequin because you can see the tabbing. I think it also may have been the fact that part of the back would have been covered by hair in the photos where you were wearing it! I think I have a bit of a thing for pearls, too. They tend to be the most tasteful “jewel”. 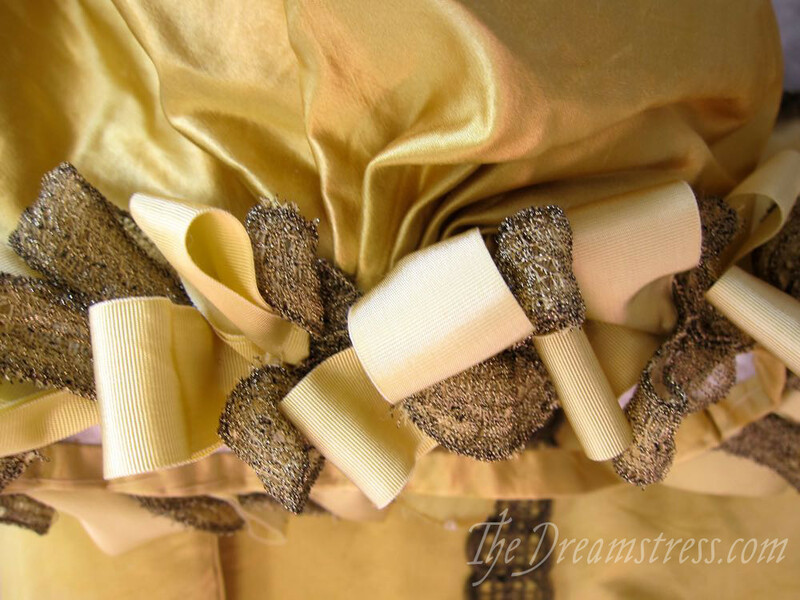 The color and the trim and the workmanship are all wonderful. What fun! You know, I imagine it in white — for a contemporary deb, or even a wedding. Here in the US they are usually “muder” these days, but this might give some young women a really distinctive look. I imagine what a lot of my dresses would look like in white for a deb or wedding. Not that a wedding dress has to be white these days! I would totally wear this in white if I were getting married again though! What is ‘muder’? That’s a slang I don’t recognise. Superb work! 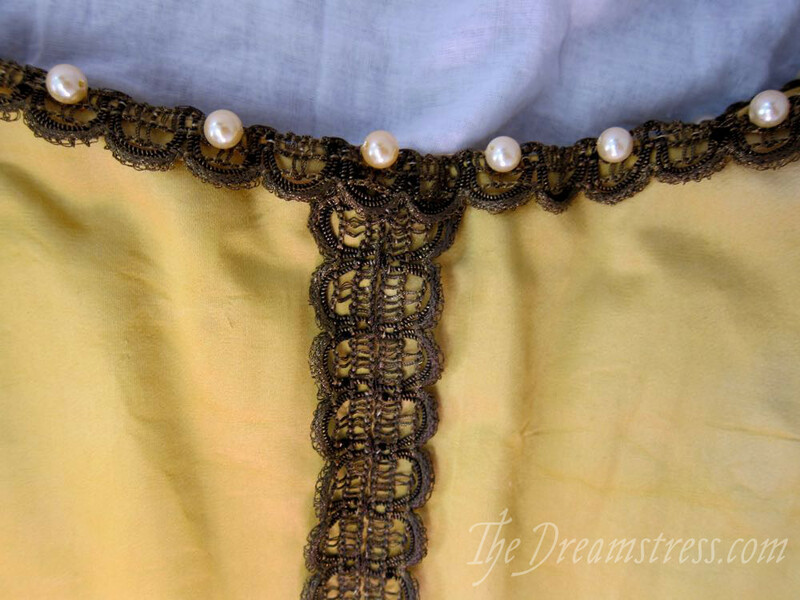 The trims look great with the yellow fabric and the pearls add the perfect finishing touch! What joy! The gown is beautiful and the trim ads contrast and “punch”. I would love to see it with the blue bows…would be a very different but equally lovely look. I do love the pearls. You are just stunning! Oh, thank you (blushes!). I may try it with the blue. Or make a similar dress in yellow and blue! I can’t begin to describe how much I admire this dress. Remember to put this post in the dress’ portfolio file, so that people can find it more easily, please. Thank you Audrey, I’m honoured! 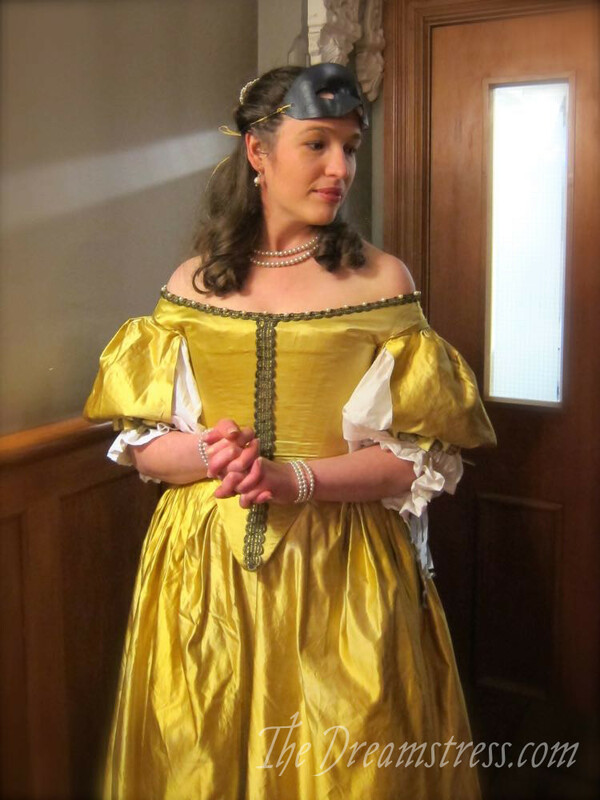 It did look lovely without trim, but this trim really brings it to life as a 17th century gown. 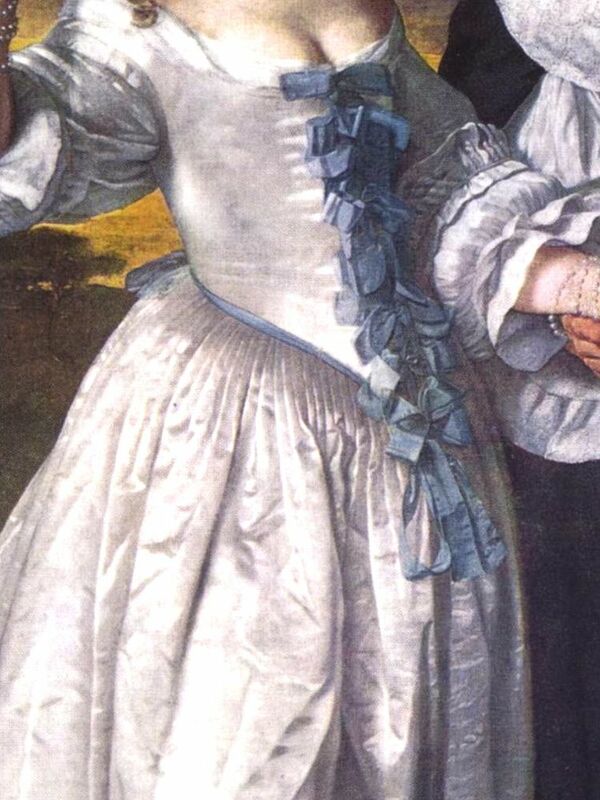 The passementerie with the pearls is absolutely perfect, and the bows on the sleeves are beautiful. I quite like that they are subtle. If I see any of those doileys with the passementerie I’ll be sure to pick them up for you. They sound absolutely hideous. Thank you! I do think the trim really makes it! I’m so glad I braved up and did it! So there is the justification for hoarding! You never know when you might need that bit of selvage you cut off in 1978. Beautiful gown looking even more with the added trim. It turned out wonderfully! I especially love the sleeve treatment and pearls. Thank you! I’m particularly pleased with the sleeves too!